Roger Federer’s mental toughness has been central to his ongoing success. In his career to date, he’s won 82% of his matches, two thirds of his Grand Slam finals, and 65% of his tie breaks. These kind of stats can’t be achieved without immense mental strength. It’s well known, however, that in his teens and early twenties, Federer struggled with a hot temper which affected his ability to play consistently to a high standard. A turning point came at the Hamburg Masters in 2001. Following a disappointing loss to Italian journeyman Franco Squillari, Federer smashed his racket in a fury. He realized that things had to change. The cool, calm Federer that we know today was born here. We don’t know exactly what changed in Federer’s mind after that match. In a 2009 interview, Federer commented that his mental transformation came about because he realized he had to take responsibility for his attitude and behavior on court. But this doesn’t tell us how Federer actually built his mental strength. Fortunately, over the past year, Federer has opened up more and more about his mental processes on court. We can now see for ourselves much more clearly exactly how he copes with pressure and the challenging thoughts and emotions of competitive high level tennis. Two post-match interviews with Federer are particularly instructive about his mental approach. Why are these comments so instructive? Because they show us that even the great Roger Federer feels intense nerves before and during matches, but this did not stop him from performing to an extremely high level. He played brilliantly and maintained deep focus despite feeling very nervous. A common misconception is that if you’re mentally tough, you don’t experience difficult emotions such as anxiety or anger. The truth is that mental strength is about being able to perform your best even when difficult emotions are present. Needless to say, Federer won that tie-break despite all the negative thoughts that were present in his mind. He accepts and tolerates all the difficult thoughts and emotions that occur in his mind and body and stays focussed on the task at hand. He doesn’t fight the negative thoughts or feelings or try to get rid of them. He just rides the waves of his emotions, and stays present and focused on the match. Federer’s not alone in taking this mental approach. His great rivals Rafael Nadal and Novak Djokovic are able to do the same. In fact, all the greats of game have had this mental ability to one extent or another. There are many ways individual players might arrive at the ability to do this. Roger will hopefully elaborate more on how he developed his mental strength in the years to come. For now though, we know that the ability to accept difficult mental experience and then refocus, can be cultivated through mental training. Tennis-specific mindfulness training is a structured and proven way to build this skill. Novak Djokovic used mindfulness to make his mental breakthrough in 2011. In the women’s game Johanna Konta boosted her ranking from 146 to 4 within a year by using a mindfulness-based approach to mental training. Many other pros are now using mindfulness to enhance their mental toughness. Anyone can train in tennis-specific mindfulness. We may not be able to play as well as Federer, but we can learn to be just as mentally strong. This entry was posted in Mental Toughness, Roger Federer, Tennis Psychology on June 12, 2018 by admin. Recent developments in sports psychology research are bringing fresh insights into tennis psychology. There is now a significant and growing body of research evidence demonstrating that mindfulness meditation techniques enhance overall sports performance by increasing an athlete’s ability to function ‘in the zone’, by sharpening concentration and awareness and by improving accuracy. In contrast, the old model of tennis psychology is based on Psychological Skills Training (PST), which research shows does not significantly enhance sports performance and can lead to a deterioration in performance. PST theory suggests that athletes perform best when they are able to control their thoughts and emotions. In order to develop this ability, athletes learn PST techniques which seek to modify negative internal experiences and replace them with positive ones. But this approach simply encourages more cognitive activity (thinking), which draws the athlete away from flow states, and makes it less likely that he/she will enter ‘the zone’. 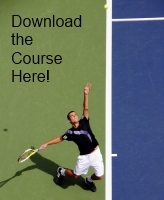 The Mindfulness-Based Tennis Psychology approach takes the opposite view – that athletes will perform to the best of their ability when they give up on trying to control internal experiences, and instead hold thoughts and emotions in a non-judgmental awareness, accepting whatever their internal experience is at any moment. This non-judging acceptance frees the athlete to place his/her attentional focus on the task in hand, rather than grappling with thoughts and feelings. In the mindful approach to tennis psychology, we accept that we cannot control the initial frustration we feel when we double fault or slam a smash into the net. With practice we learn to simply experience that frustration and any associated thoughts (ie. ‘Not again! What’s wrong with me today, why can’t I play? I’ve practiced that shot a thousand times’ etc) before choosing to refocus our attention on the task in hand – the next point – rather than ruminate between points about how badly we’re playing, or how we’re going to have to practice extra hard after this match is over to make sure we don’t hit shots like that again. Gradually, by practicing the mindful approach to tennis psychology, you will find that your negative responses to missed shots and lost points decrease, and that you are increasingly able to brush off mistakes and get on with the job. This entry was posted in Tennis Psychology on January 31, 2016 by admin. Novak Djokovic may be the mentally toughest player in tennis, and the secret to Djokovic’s mental strength is mindfulness meditation. The Serbian world number one reveals in his recent book Serve to Win, that mindfulness meditation enabled him to overcome self-doubt, recover quickly from mistakes and fulfil his potential as a tennis player. Djokovic writes that since practicing mindfulness meditation he is now able to notice negative thoughts and let them pass by. He explains that he can now focus fully on the present moment, processing pain and emotions without getting caught up in unnecessary thinking. Djokovic’s mental strength, brought about by mindfulness practice, has resulted in him being the most consistent of the big four players since 2011. Djokovic’s use of mindfulness meditation has also helped him become one of the greatest comeback players of all time. His remarkable victories from match point down against Roger Federer at the US Open in 2010 and 2011, and against Jo-Wilfried Tsonga at the 2012 French Open were only possible because of Djokovic’s ability to remain calm on the big points and allow negative thoughts and fears to be there without engaging with them. Djokovic’s mental strength, underpinned by mindfulness, is also expressed in his impressive sportsmanship. Djokovic is the only one of the big four to regularly applaud excellent play by his opponents. In defeat, Djokovic is generous and dignified. Despite tough losses this year to Nadal at Roland Garros and Flushing Meadow, and to Murray at Wimbledon, Djokovic offered warm and genuine congratulations to both, and expressed appreciation for the privilege of playing them. Any tennis player can learn mindfulness meditation. By practicing the meditations in the Mindfulness-Based Tennis Psychology course, you will be able to enhance your mental strength, as Novak Djokovic has. Also, check out my latest article about Novak Djokovic’s Mental Training. This entry was posted in Djokovic's Mental Strength on November 11, 2013 by admin.